For each type of plant, the following products are available. The classic bare-rooted plant. This is a one-year old vine that was grown in a field. It has a developed root system and a dormant ligneous stem. Recommended planting dates go from March to June. Planting during the fall months is also possible but special Care must be taken in insure successful growth of the vine. From September to December, custom production for delivery the following year. All year long, a large selection of combinations from our products already in stock. 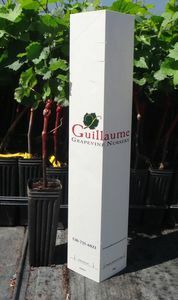 The Super-Pot was first introduced to the US grapevine industry by Guillaume Nursery and has been adopted by the industry as a whole since then. First produced, it is then grown in a 1-liter plastic pot with compost. The Super Pot favors a highly developed root system which allows quick rooting and optimal growth right after plantation. From January to March: custom production for delivery from May. We are offering a new product to our customers to promote better growth of their newly planted vines. Our new 24" plant protector will provide protection for your plants from intense sun, herbicide spray, wind damage and rabbits. The better is to order your vine protectors at the same time as your vines so we can make sure to have them available for you when you need them.